Oh yes, I have a beauty haul for you. I think this month for the first time in ages I've actually gone a bit ott with my make up purchases, however I have two excuses- Holly's wedding (roll on Saturday) and Tenerife in October. So what have I been spending my pennies on this month..
Superdrug Nail Whitening Tables £2.99- my nails are horrible at the moment, from fake tan, and forgetting to wear base coat. I have a review on this to come in the next few weeks, so all what I will say on this is don't waste your money. Barry M Lipstick in 147- aka the Mac Ever Hip dupe. This is my first ever BM lipstick and in all fairness I'm finding this quite drying on my lips compared to my Mac lippies. Originally bought this for my holidays as I'm not taking my Mac babies with me. This does look fab with a tan though, kinda more of a pigmented Mac Cut a Caper. OPI Steady as She Rose- from the Pirates of the Carribean Collection. I bought this from ebay (beautyzone2007) and it cost approx £5 (including p+p from America), delivery is super quick too. It look a week to come. This is the colour I'll be wearing on my nails for the wedding on Saturday (Holly has approved it) so expect a NOTD on it soon. OPI Over the Taupe- Again bought from ebay, I wore this for the hen do pt 2 the other week, and its worth noting you need two coats for this. The polish was quite watery if that makes sense. However I do love it, and I have a NOTD ready to post this week on this. Sleek Pout Polish in Milkshake- again I've bought this ready for my holidays, really like how its not too pink on your lips. Definately going to buy Minx (?) next month. Haven't really had much time to play around with this, however I am very impressed. Mineralize Eyeshadow in Rare Find- I am in love with this eyeshadow. 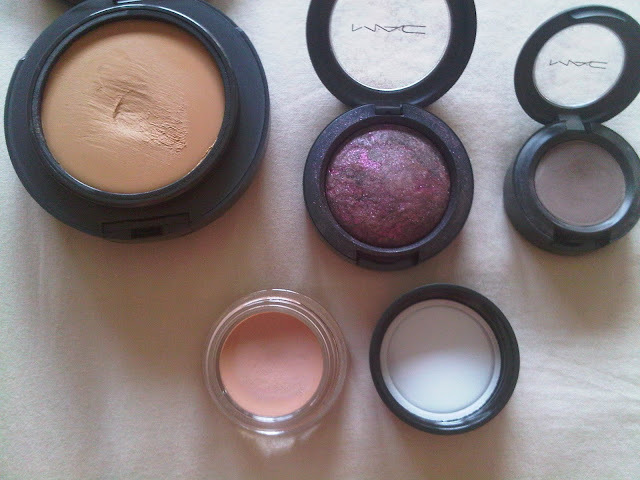 I never even both looking at the mineralize eyeshadows when I go to the Mac counter, its up there with Typographic as my favourite eyeshadow. Eye Shadow in Copperplate- I asked the MUA if she could use Typographic on my eyes, and along with Rare Find, she used this. She put Typographic on the brush, tapped into Copperplate and seriously it looks gorgeous!! Fab addition to my eyeshadow pallete. I'm hoping I can recreate this smoky eye next time I'm out. Paintpot in Painterly- This along with my foundation were the real reasons I went to get my make up done. I could be here all day gushing about it but I have stuff to do. Its just love- if you don't have this in your primer collection, run out and buy it now. Barry M 147, Sleek Pout Paint in Milkshake, Mac Paintpot in Painterly, Mac Eyeshadow in Copperplate, Mac Mineralize eyeshadow in Rare Find, Mac Stuid Fix Foundation in NC35. All what I need now is a couple of ELF make up brushes, Head over Heels or Flush Cream Blush from Topshop, and the other Sleek Pout Polish and thats me done... not including the Models Own 50% off sale lol. The MAC makeup artists annoy me! My skin is clearly NW, yet she gave me NC15? So confusing! 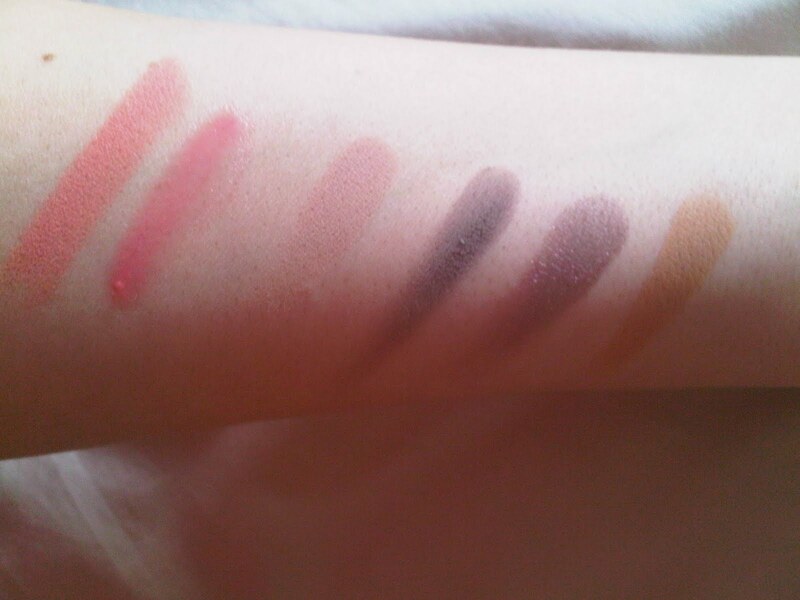 great swatches & reviews, I need to treat myself to a mac lippie soon!! I've heard great things about OPI Over the Taupe and MAC Rare Find looks gorgeous! The mineral eyeshadow looks super fabulous!! !